After the mysterious disappearance of Malaysia Airlines flight 370 this March, the biggest hinderance to the investigation has been the lack of data from the flight data recorder and cockpit voice recorder, presumedly submerged with the rest of the wreckage. But now Airbus will implement a solution for future incidents. It's one of those hindsight situations, where you come up with something that would have been really helpful, now that you're in a bind. Airbus has announced that they will install recorders that can be jettisoned from the aircraft and easily located when it goes down in the water. 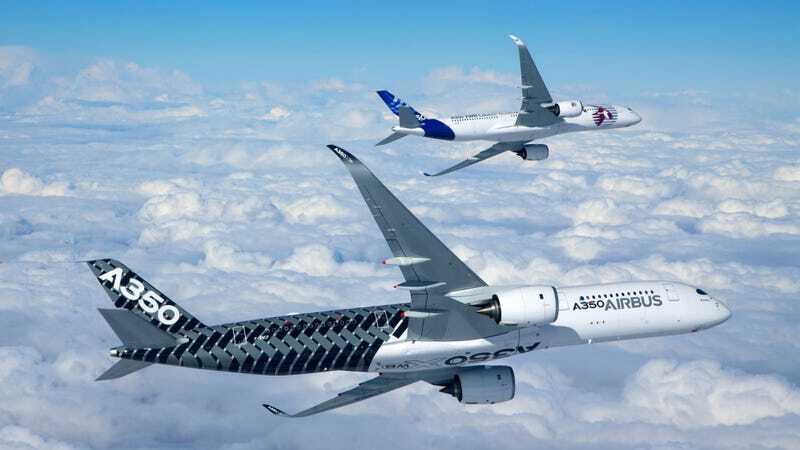 Their A350 and A350 will get these, according to a tweet from Flight Global's Stephen Trimble. The maker of these devices, DRS Technologies, is based in Virginia. They make a wide range of devices for primarily military use, including thermal imaging systems, combat display workstations, air combat training systems, military trailers and shelters and logistical support services. This isn't exactly a new idea, but it will be the first application of the technology on passenger jets. Boeing has installed some similar devices on military planes, including the P-8A and E-4B. Boeing has hesitated to add them to the commercial fleet, because they've reported a couple of inadvertent deployments. Coincidentally, it's a Boeing 777 jet that is missing in the MH370 case. As far back as the 1960s, the National Research Council of Canada proposed "some form of detachable and automatically activated Emergency Location Transmitter (ELT). Flight Safety said (in 2009), that deployable ELTs had been in use for 25 years on military aircraft and helicopters in areas such as the North Sea during oil exploration. During their use, 110 aircraft had crashed, and all were successfully located. This system Airbus will use will include not only the ELT, but also the data from the Flight Data Recorder and Cockpit Voice Recorder. This seems like a no-brainer, and something that should be required on any aircraft that flies over the water for long periods of time.